About ten youths from Kisumu county were stripped n@k3d and seriously beaten with crude weapons and forced to run around Kisumu town on Monday by an unknown group of people. The victims who suffered deep wounds and other injuries all over their bodies and are admitted in various hospitals in the lake side city. One of the youth, Paul Owino, who is nursing a broken arm, said that the group met him near Cooperative Bank and ordered him to remove all his clothes before beating him and demanding that he names those responsible for various robbery incidents at various shops in town. 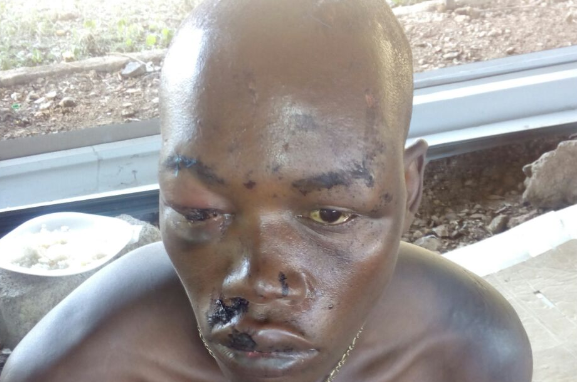 Owino, who is a car wash attendant near Winmart Market, could not give any names and the gang tortured him before grouping him with other youths and beaten. A local resident who did not want to be named said that the police in Kisumu are aware of the gang but have not taken any action against them. Owino recorded a statement at the Central Police Station on Wednesday over the incident.